Gyepa Rinpoche (b. 1960) is a main lineage holder of the Töluk tradition of the Dudjom Tersar, the lineage which originated from Dudjom Lingpa and was established by his direct student Degyal Rinpoche, who settled on the slopes of Mount Kailash and established Namkha Khyung Dzong. As such, he is a main lineage holder of the Tröma Nakmo cycle of the Dudjom Tersar. Gyepa Rinpoche was born on July 29, 1960 in Muchu, Nepal, to his father, the Second Degyal Rinpoche, and his mother Kyama Tshering. Gyepa Rinpoche’s grandfather was therefore Golok Serta Rinpoche, a highly revered Dzogchen and Tröma Nakmo practitioner, and a heart disciple of the first Degyal Rinpoche, who was one of the Thirteen of Dudjom Lingpa's disciples who attained rainbow body. Gyepa Rinpoche was raised in a religious environment under special care and guidance from his father, acquiring a thorough grounding in reading, writing, ritual and Dharma from a young age. 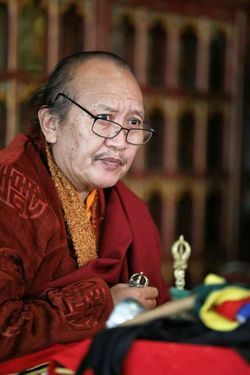 After the passing of his father the second Degyal Rinpoche in 1985, Gyepa Rinpoche founded Namkha Khyung Dzong (Nepal); Namkha Khyung Dzong Nunnery in Orissa, India; and Namkha Khyung Dzong Dharma Society in Taipei, Taiwan, continuing to spread, to this day, his father’s Dharma activities.